The world’s great wines have a way of inspiring incredible generosity. Over the years I have had the good fortune to meet many wine lovers who have opened rare bottles for me to taste that I would have never otherwise had a chance to appreciate. For that reason, I was thrilled to share these two magnums from my cellar with a group of friends over a recent dinner. Both magnums came directly from the Mascarello winery and were beyond impeccable. The 1986 Barolo, from magnum, is a real head-turner. Still deep and powerful to the core, the 1986 surprises for its exceptional overall balance. The flavors are dark, brooding and totally enveloping in a wine that conquers all of the senses with its sweet, perfumed aromatics and resonant fruit. Even at nearly thirty years of age, the 1986 is youthful and shows no signs whatsoever of fading. What a gorgeous wine this is. The 1986 growing season is remembered for a massive hailstorm that devastated vineyards. In some places, though, the plants were able to set a small crop that resulted in unusually dense, powerful Barolos. 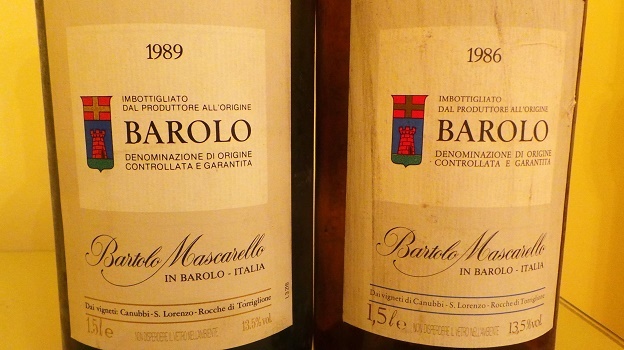 A number of winemakers, Bartolo Mascarello and Bruno Giacosa among them, long maintained 1986 was a superior vintage to the much more famous and celebrated 1985. Tasting Mascarello’s 1986, it’s easy to see why. 96/Drinking window: 2014-2044. Silky, refined and lifted, Mascarello’s 1989 Barolo presents a much more feminine, gracious expression of Nebbiolo. Cedar, sweet tobacco, dried cherries and leather open up in perfumed, delicate Barolo full of personality. The 1989 is a more polished wine than the 1986 tasted alongside it. At the same time, the 1989 suffers from less that perfect aromatics that are likely the result of older barrels. Even so, the 1989 is flat-out stunning. The reality, though, is that it could have been an even better wine. 95/Drinking window: 2014-2034.